Dr. Seuss’s The Cat in the Hat was one of my favorite children’s books to read to my son in his younger days. I’ve read the story of the Cat, Thing One and Thing Two and all of their crazy antics more times than I can remember. 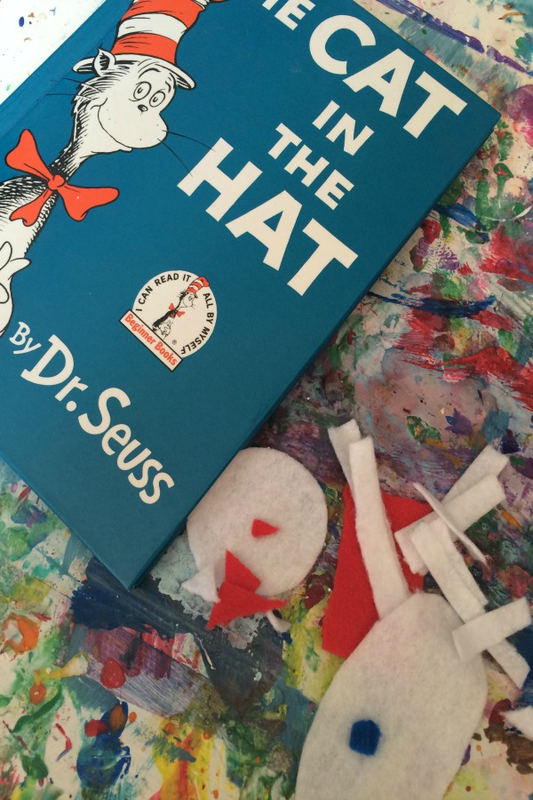 If your child adores this classic as much as mine did, this art activity is an easy way to celebrate the Seuss story! I’ve been making felt crafts right and left. I pulled out my old DIY felt board and got to the art-making. 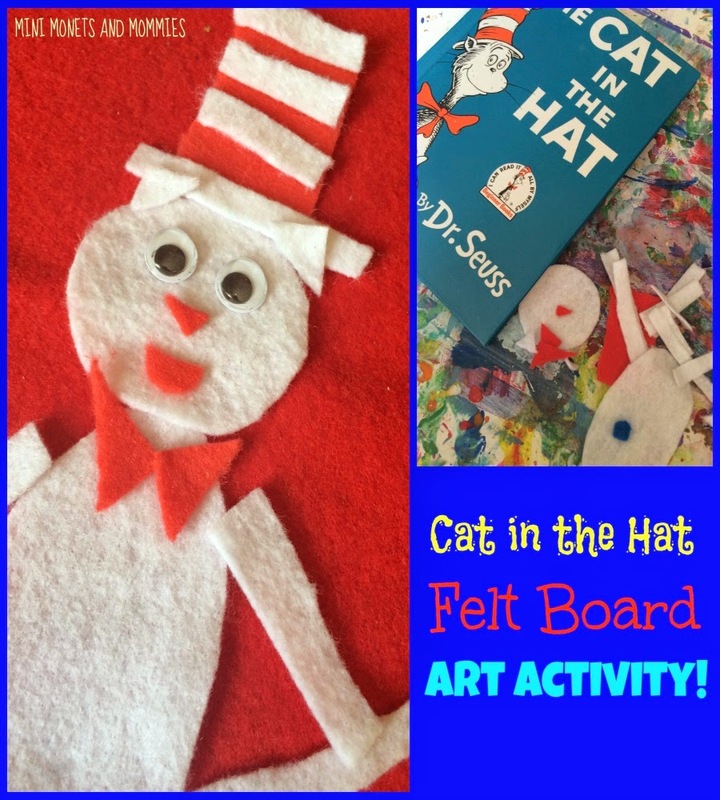 This activity allows your child to create her own version of the Cat in the Hat. She can play with the shapes, patterns and story elements of the book by making her own cat-themed felt collage. Start by reading The Cat in the Hat with your child. Note the word “with” and not “to.” Engage your child in the book-reading by asking her to point to pictures when you say the words, make some of the movements she sees or even help to act out the story! 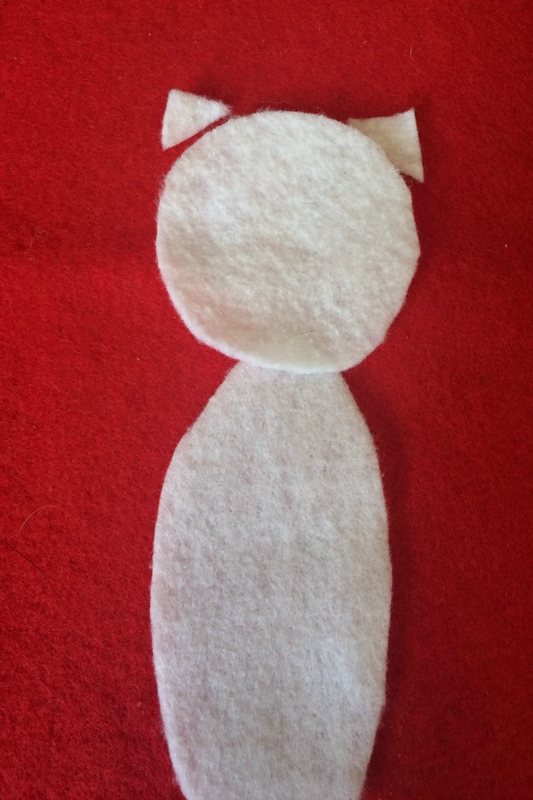 · Craft felt sheets in white and red (you can also choose other colors for the cat). 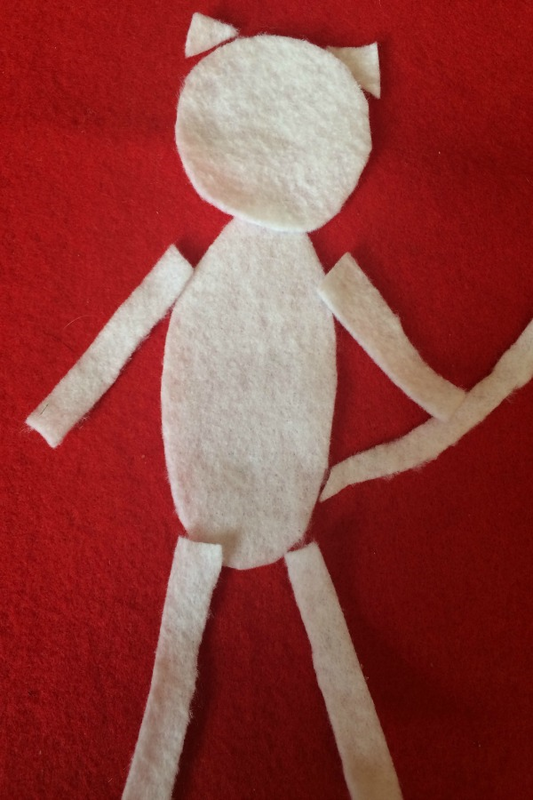 · Optional: Felt board—You can use a sheet of craft felt or make your own board. If you want to make your own felt board, follow my super-simple tutorial. 1. Draw a few shapes onto white (or another color) felt to make up the cat. 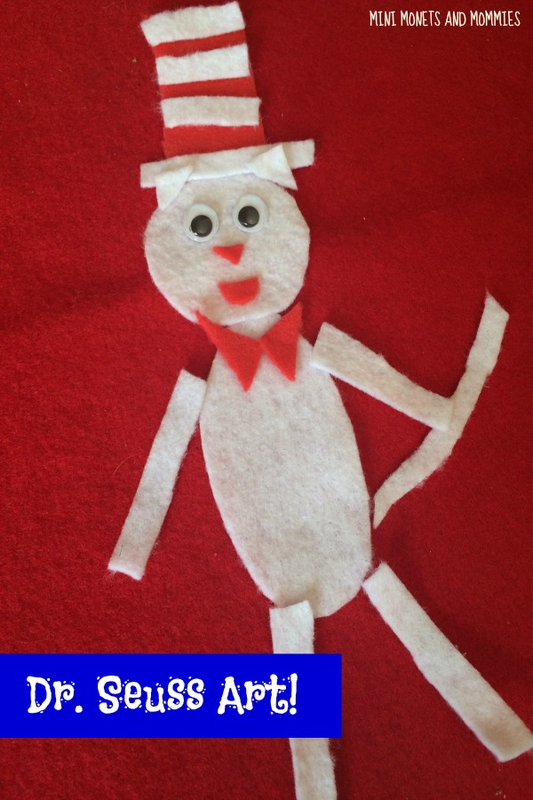 Your child needs a circle for the head, an oval for the body, triangles for the ears and long, thin rectangles for the arms, legs and tail. 3. Draw shapes for the cat’s hat. Make a red rectangle and a few thin white rectangles. 4. Cut the hat out. 5. Build the cat on the felt board. Have your child puzzle together the cat. 6. Add facial features. Your child can draw these on or add googley eyes (with glue). 7. Cut out two small triangles from the red felt. 8. Glue the triangles on the cat (under his head) as a bow tie. 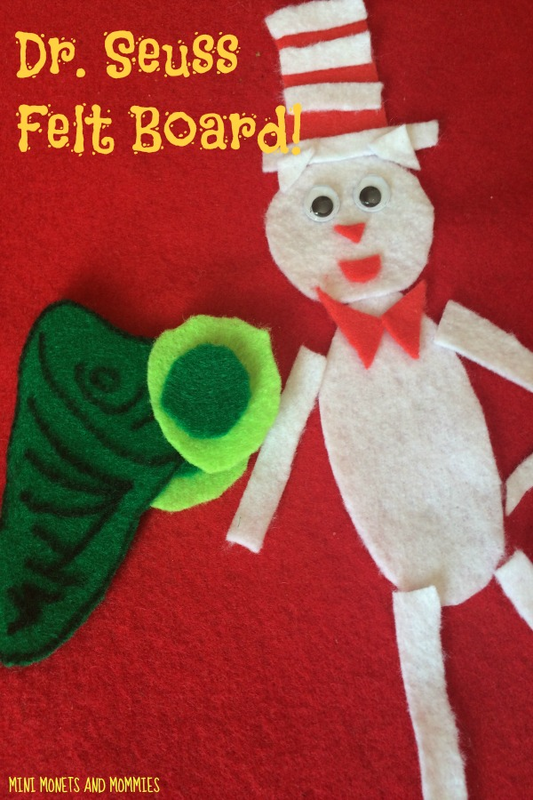 Your child can also add other Dr. Seuss favorites, such as Green Eggs and Ham shapes, to the felt art activity. Are you looking for more children’s book-themed activities? Follow my Pinterest board for ideas! Follow Mini Monets and Mommies's board Childrens' Book Activities on Pinterest.